Celebrating the East African Community | Hujambo! The phrase is some deep Tanzanian Swahili, but I cracked the code with a little dictionary magic: unity is strength, separation is weakness. A kanga, by the way, is an extremely common garment in East Africa. I have personally seen them all over Kenya, Tanzania, Uganda, and even Rwanda. 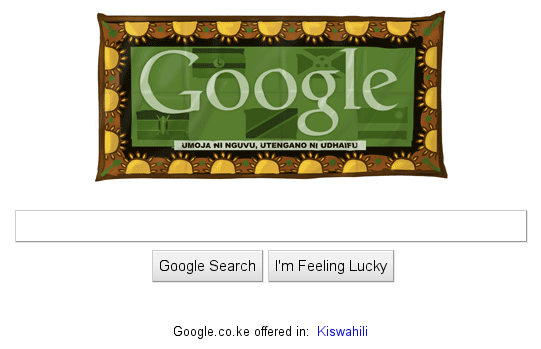 They usually have Swahili proverbs written on them, so it’s the perfect icon of East African unity in so many ways — Google really did their homework. Anyways, according to Reuters, the goal of the East African Community is “to have a common currency in 2012 and turn into a political federation in 2015.” Good luck, guys! I’ll pass on your comment about having done their homework to the relevant people.